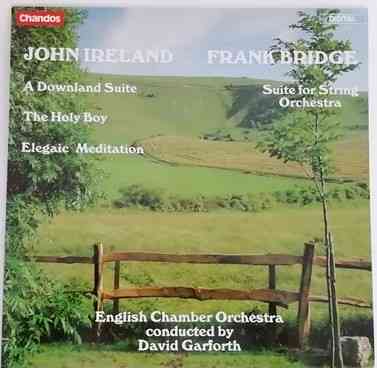 33rpm LP Record of ABRD 1112 John Ireland Frank Bridge SUITE FOR STRING ORCHESTRA HOLY BOY ELEGAIC MEDITATION featuring the English Chamber Orchestra conducted by David Garforth. It was issued on the Digital Chandos Records label in 1984. UK pressing. The record itself is graded excellent, with no more than the odd light surface mark visible under normal domestic lighting. Play-tested on a USB turntable. Superb sound quality, with NO jumps, repetitive ticks, or crackle and just an occasional light pop. Otherwise more or less faultless playback.